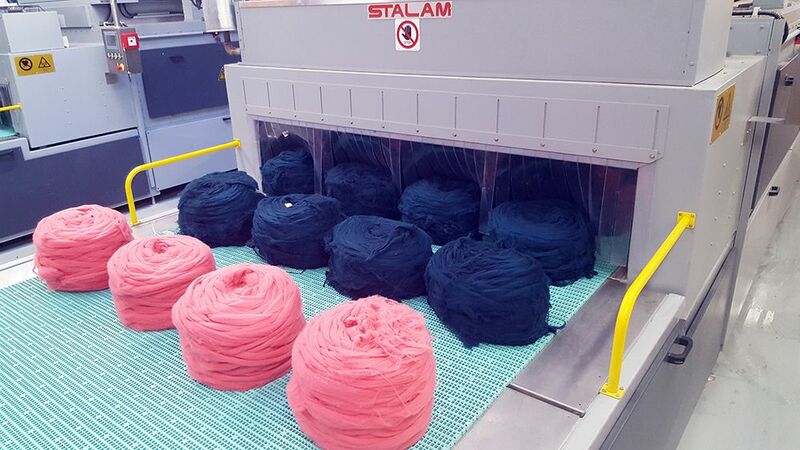 With more than 1,800 units in operation, the "RF" series dryers are Stalam’s best sellers. They are multi-purpose dryers particularly suitable for yarn in packages and cakes as well as for worsted fibres (tops) in bobbin and bump form. Almost all combinations of natural, artificial and synthetic fibres, pure or blended, in every count and form can be dried perfectly, down to the desired residual moisture level, with outstanding efficiency and quality results that cannot be achieved with any conventional drying system. In the "RFA" (Radio Frequency Assisted) series dryers, the RF treatment is combined with a conventional warm air circulation system. 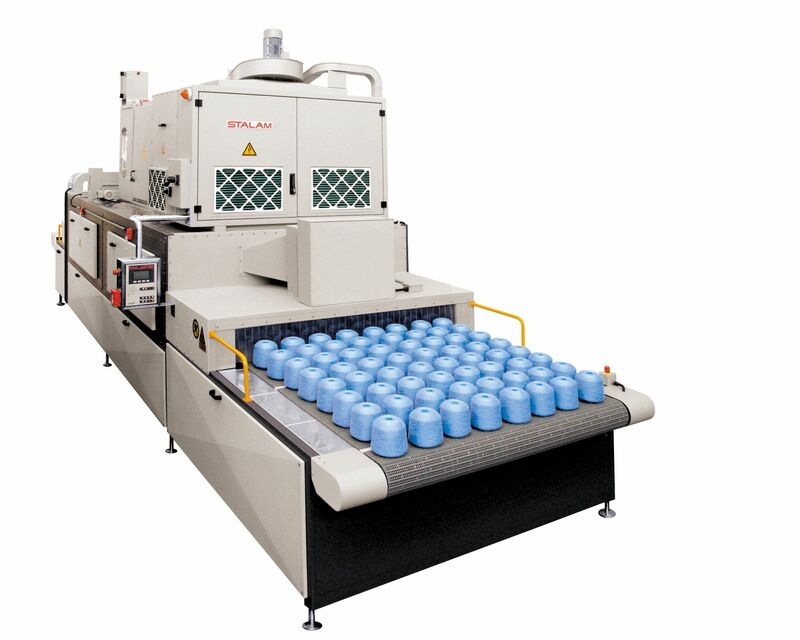 Over the years, several innovations have been introduced in the "RF" and "RFA" series dryers, like the extensive use of stainless steel inside the drying tunnel, a new conveyor belt tracking and tensioning system, the modular-type polypropylene conveyor belt, the multi-position upper electrode system, the new electronic board to control the RF generator’s working parameters and the PLC with related software for the fully automated management of the drying process. The state-of-the-art Stalam "RF" and "RFA" model dryers allow savings in operating costs up to 10-15% compared to other standard radio frequency dryers available in the world markets. In the past several years, many efforts have been devoted by Stalam to the development of new, more powerful and even more reliable generators and today the available models list includes the “RF 125 kW”, the “RF 150 kW” and the “RF 180 kW” single-generator Radio Frequency dryers. 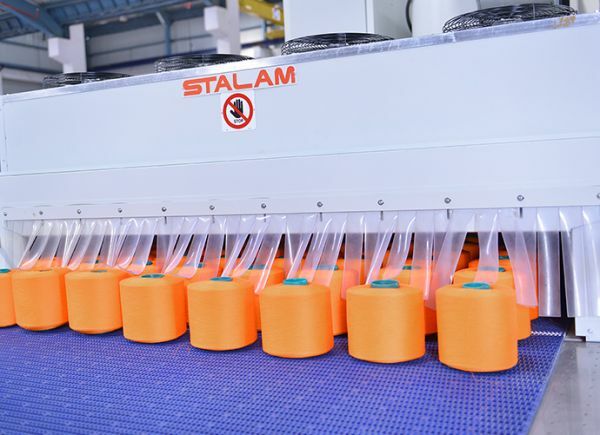 Stalam's new "RF 180 kW" dryer represents a world record as to output power rated by a single RF generator in the textile industry. The RF power distribution electrode has been adequately sized to maintain the lowest possible power density on the product being dried. Moreover, the innovative air circulation and evacuation systems assist the evaporation process maximizing the moisture removal efficiency while avoiding all dew condensation problems inside the drying tunnel. 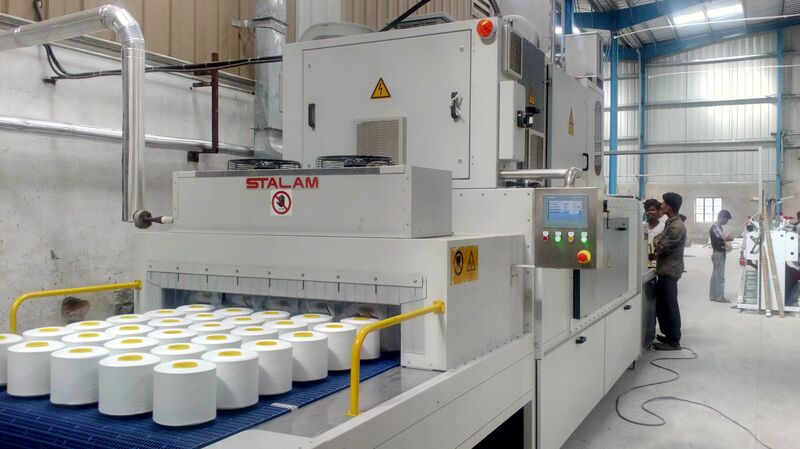 The dryer functioning is supervised by a Siemens Simatic S7-1200 PLC complete with a KTP series touch-screen O/P, running the software specifically developed by Stalam for the reliable, safe and easy operation of its RF dryers. The “RF 125 kW”, "RF 150 kW" and “RF 180 kW” dryers are mostly dedicated to medium and large capacity yarn package dye-houses that have the possibility, for example, to dry, respectively, over 7, 8 or 9 tons/day of 100% cotton yarn packages in a machine which is just slightly longer than the 85 kW and 105 kW model dryers. These new high-powered Stalam dryers enjoy the most favourable productivity /space and productivity / cost ratios - as to both capital investment and operating costs - improving further the outstanding economical convenience of the “RF” series dryers.